Remember when drugstore brands had cool polish? I miss those days. I love indies, but I do miss the days when hunting for awesome drugstore polish was part of being a nail polish addict. I remember looking for this Milani collection all over town. I think the Walgreens and CVS employees then knew by name when I came in and always pointed me toward new nail polish. This polish came from one of my favorite drugstore collections to date. In fact, I'm surprised indies haven't created more polishes like these. I'd love polishes like this one in every color of the rainbow! 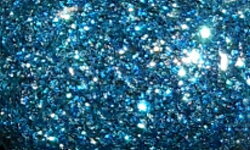 Blue Flash is a opaque electric blue microglitter. Color: Bling city-tastic. This glitter and the rest in this collection were spectacular. I love how these were opaque micro-glitters. These completely covered your nail and the colors were intense and bright. This color is a gorgeous blue and boy does it shine! Formula: These all said "One-Coat Glitter" on the bottles. This isn't the case though, this was more like 2 coat glitter. That being said, I can EASILY forgive that based on how amazing it is. The glitter on this applied smoothly and easily. I will say I did need some thinner to thin this out after being in my Helmer for 5 years. Price: Yes, you can still find this one on e-tailers for around $4. Overall: I wish I may, I wish I might that someone make glitters like this in more colors. If there is an indie who has glitters like this please let me know! I love this finish and the one tone of color. This is an fantastic polish that has been a favorite of mine for the past 5 years. I love it and I'd love more!